"When a guy's ready, you give him one more day just to have that peace of mind." Which doesn't sound weird, except for the part about Rasmus being in the original lineup that was posted for two hours. Rasmus didn't make it an issue after the game, but reading between the lines most writers covering the Cardinals seem convinced that his relationship with La Russa has gotten very bad. 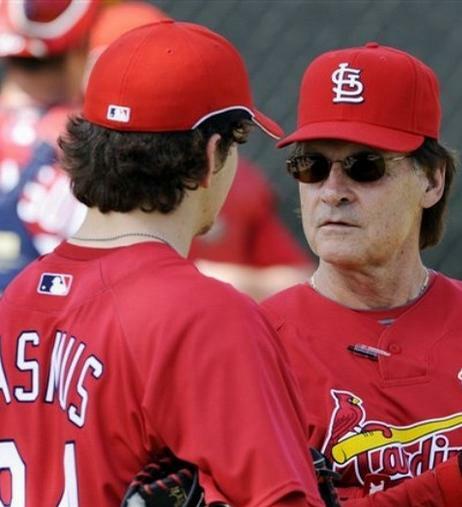 "He's had all the work," La Russa said. "He's never backed off the work, taking batting practice. I think it all has to do with what his concentration is, and what his focus is. I do believe that -- you just watch his swings in batting practice and in the game -- I think he is convinced that he helps us more if he just yanks the ball out of the park. That normally is not the case, because you're limiting yourself to a side of the park and you're vulnerable to too many pitches. We really push, 'Just play the game.' That's what Jon [Jay] does. He plays the game. take a single, take a walk, let the home runs come." So Colby isn't getting at bats because he doesn't 'just play the game' like Jon Jay does? Rasmus is hitting .268/.352/.501 which might not look as good as Jon Jay's .330/.379/.481 at first glance. But Jay's .376 BABIP compared to Rasmus' .341 suggests Jay has been more lucky at the plate. Plus Rasmus has a better BB% (11.4) than Jay (7.0) which should offset some of the perceived OBP discrepancy. It doesn't end there though. I completely agree with Vivo El Birdos that this isn't a Rasmus vs. Jay argument. There is room for both of them in the outfield and the lineup. There is something else going on here. This seems like a perfect time for some wild and careless speculation. 1. Inappropriate joke about Colby Rasmus and one of TLR's estranged daughters. Preferably the 25-year-old but you guys can do what ever you want with this one. 3. Rasmus' -4.5 UZR in center field is simply unacceptable. This is the least likely unless TLR figured out his dial-up password and stumbled onto FanGraphs. Tony didn't like Scot Rowland,Jim Edmounds,Ozzie Smith. They should get rid of Tony LaRussa he wash up. I hate to say, buy when the cardnials become the rams, you could not give away rams tickets, it looks like the cardnials are heading down the same road, poor coaching, poor mangement. The cardnials have no fire no heart, the coaching staff makes so many mistakes from pitching staff calling the wrong pitch, to the coac from not getting these guys ready to win, not just show up. The players may not belive to tony ball any more. If he can not do his job it is time to move on, and bring some one else in, be for it is to late to save the season. Players and coaches come and go, it may be time to move on, there are some home town players that may be the shot in the arm the cardnials need (ozzie,jack,Mr Herzog) these players had the fans at there back, and know how to win, and know who they are playing for, The Fans. The Cardinals could have a player finish in the top three of the three major awards and finish 10 games out in the Central. I can't see TLR coming back next year and I really think there's more to the Rasmus thing.